There are obvious differences between Regina, Saskatchewan and Montreal. Here, millions of people walk the streets daily. There, roughly 240,000 individuals inhabit the city. Other noticeable differences include the vast number of buildings, the French language and the overall faster pace of life that defines Montreal to a tee. For the new Stingers football player Matthew Halbgewachs, who is born and raised in Regina, there’s something else that stands out about his new home, a certain buzzing sound he hears every single night. Getting used to the sound of the critters that inhabit his neighborhood is not the only thing he’ll have to adjust to. After playing in the Canadian Junior Football League, Halbgewachs will face some of the country’s top prospects coming into the Réseau du sport étudiant du Quebec. Halbgewachs is a seasoned offensive lineman who spent four years in the CJFL. The league itself houses 20 teams in six provinces and is divided into three conferences: The Ontario Football Conference, British Columbia Football Conference and the Prairie Football Conference. Halbgewachs played in the latter conference with the Regina Thunder. Along with representing the Thunder in the PFC all-star teams in 2014 and 2015, he was also named the conference’s outstanding offensive lineman and CJFL all-Canadian in 2015. He also gained some valuable experience practicing with the Saskatchewan Roughriders last year during his time in the CJFL. After joining the Stingers, the French television sports channel, RDS, rated Concordia’s offense with an “A-” and attributed this high grade partly to the acquisition of Halbgewachs. Despite these honors, the 22-year-old remains naturally humble and doesn’t let his past successes get to his head. He is fueled by his desire to work hard and improve on a daily basis without taking anything for granted. Halbgewachs had the chance to play another year with the Regina Thunder and practice with the Roughriders again but he opted for a change in scenery. While playing in the RSEQ will give him an edge in his pursuit for a career in the CFL, he also wanted to finish school before moving forward with his plan. His time with the Roughriders gave him perspective on the life of a professional football athlete and made him realize the precarious nature of this career path. 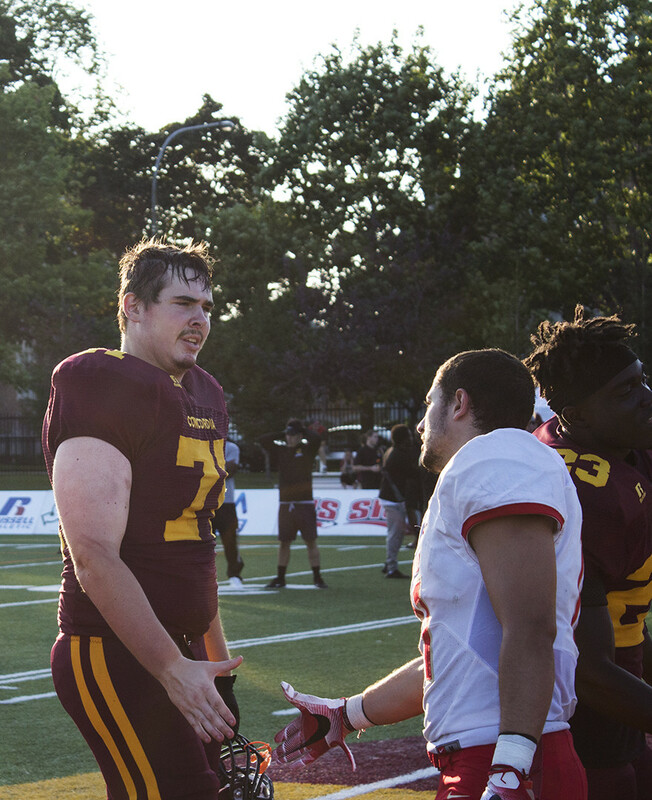 Halbgewachs got his first taste of CIS football when Concordia defeated the McGill Redmen on Sept. 2 for the Shaughnessy Cup. He came away with a few positives and negatives that he plans on improving as the season progresses. The six-foot-five, 305-pound tackle has already noticed some differences between the football played here compared to the game out west. For starters, players in the RSEQ are older than those in the CJFL. Because everyone in Quebec must go through CEGEP before attending university, rookies often come into the league around the age of 20. Halbgewachs was used to playing with guys who just finished high school. This depth allows for coaches to use a variety of different defensive strategies, enabling a greater form of specialization and skill that isn’t found in the CJFL. While certain adjustments need to be made, the Stingers head coach is pleased with his new recruit, praising Halbgewachs for his work ethic and quick feet. Donovan feels that he will be able to compete and raise his game to a different level by playing in the RSEQ. “He wanted to play against the best and he knew that coming to the Q, he was gonna get that,” said Donovan. Not only will he get to play against some of the top players in Canadian university football, he also gets to side with last year’s RSEQ MVP and quarterback Trenton Miller. As an offensive tackle, which is a kind of offensive lineman, he is required to prevent Miller from being attacked by the opposition’s defensive line. While they’ve only known each since last December, they’ve developed a strong bond on and off the field. Along with being teammates, they have also taken their relationship to the next level—by becoming roommates. Halbgewachs also appreciates his roommate, but can’t say the same for his cleanliness. “He’s pretty clean but he doesn’t do his dishes,” he said, chuckling. There remains a lot of football to be played for Halbgewachs, who has three years of eligibility in the RSEQ. Coach Donovan believes that he will be recruited before that time is up. Until then, the new Stinger has only one goal in mind and a burning desire to accomplish it: winning the Vanier Cup. “We wanna be one in zero every week,” said Halbgewachs.